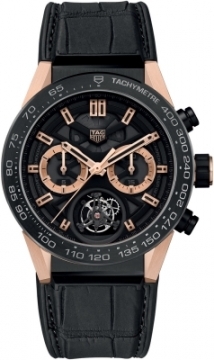 Buy this new Tag Heuer Carrera Calibre HEUER 02T Tourbillon Chronograph 45mm car5a5y.fc6377 mens watch for the discount price of £16,490.00. UK Retailer. Availability Estimated 14-28 Day Delivery Want it sooner? Lugs: 18kt rose gold with brushed & polished finishes. Middle case & Case Back: Fine brushed black titanium carbide coated titanium. Black ceramic bezel with grey engraved tachymeter scale. Lug end-pieces: Fine brushed black titanium carbide coated titanium. Crown: Satin finished 18kt rose gold with rubber grip. Chrono pushers: Satin finished black titanium carbide coated titanium. 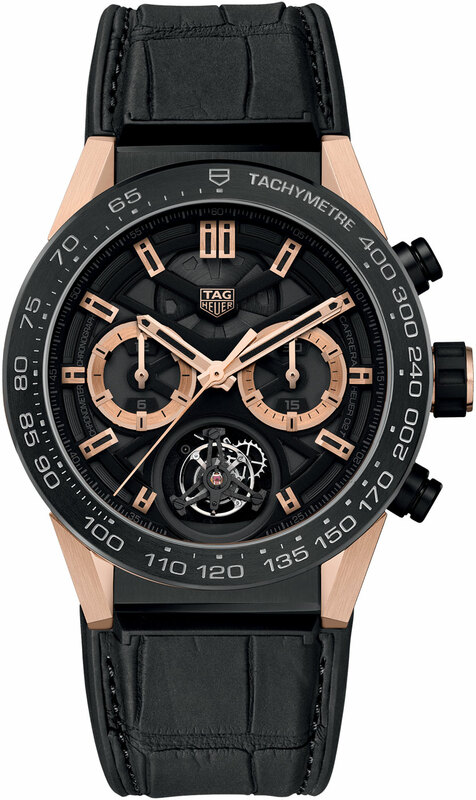 Skeletonized with black & rose gold toned rims. Applied brushed & polished index hour markers with black luminous fill. Fine tone-on-tone black printed minute/seconds & fractions-of-a-second track on the black dial flange. Polished & sand-blasted finished hour & minute hands with black luminous fill. Polished solid chronograph related hands. 60 second Tourbillon located at the 6 o'clock position. Tourbillon cage made of carbon & titanium. Large central seconds hand counter. Silver rimmed 12 hour counter sub-dial located at the 9 o'clock position. Silver rimmed 30 minute counter sub-dial located at the 3 o'clock position. Beats at 28,800 vph (4Hz). Approximate power reserve of 65 hours or +/- 40 hour if the chronograph function is running. Grey & black treated bridges, plates & rotor.